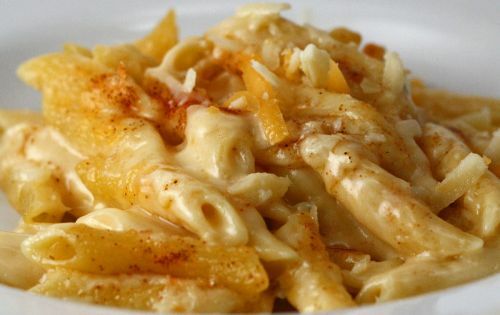 Cheesey Mac and Cheese ======================== Perfect Mac-n-Cheese (serves 4 as a side dish) 8 ounces penne pasta (half a box) 2 cups Beecher’s Flagship Cheese Sauce (see below) 1 ounce Cheddar, grated 1 ounce Gruyere cheese, grated 1/4 to 1/2 teaspoon chipotle chile powder Preheat oven to 350 degrees. Oil or butter an 8-inch dish. Cook the penne 2 minutes less than the package directions. You want the noodles not quite done because they will finish cooking in the sauce in the oven. Rinse the pasta with cold water and set aside. Combine cooked pasta and Flagship Sauce in a medium bowl and mix carefully but thoroughly. Scrape the pasta into a prepared baking dish. Sprinkle the top with the cheeses, then the chile powder. Bake uncovered for 20 to 30 minutes, until the top has a nice golden crust. Let sit for a few minutes before serving. If you decide to make this as a main and double the amounts, use a 9×13 inch baking pan and increase the time to 30 to 35 minutes. Beecher’s Flagship Cheese Sauce (makes 4 cups) 1/4 cup butter 1/3 cup all-purpose flour 3 cups milk 14 ounces semi-hard cheese, grated (I used Beecher’s Flagship Cheddar) 2 ounces grated semi-soft cheese (I used Gorgonzola) 1/2 teaspoon kosher salt 1/4 to 1/2 teaspoon chile powder 1/8 teaspoon garlic powder Melt the butter in a heavy-bottomed saucepan over medium heat. Whisk in the flour. Continue to whisk and cook for 2 minutes. You just made a roux, a substance used for thickening sauces! Slowly add the milk, whisking constantly. Cook until the sauce thickens, about 10 minutes, stirring frequently. Now you turned the roux into a bechamel. Remove from the heat. Add the cheese, salt, chile powder and garlic powder. Stir until the cheese is melted and all the ingredients are incorporated, about 3 minutes. If the cheese isn’t melting completely you can put the pan on low heat. Use immediately or refrigerate for up to three days! Buddy the Elf, what's your favorite color?! DIY Pressed FLower Pendant. Fun DIY Christmas gift. Savvy Southern Style: Traditional Thanksgiving tablescape. Love the mis-matched dinnerware!